1) Go back to some of your previous contributions and reflections, and compare them with what you have learned in this week. 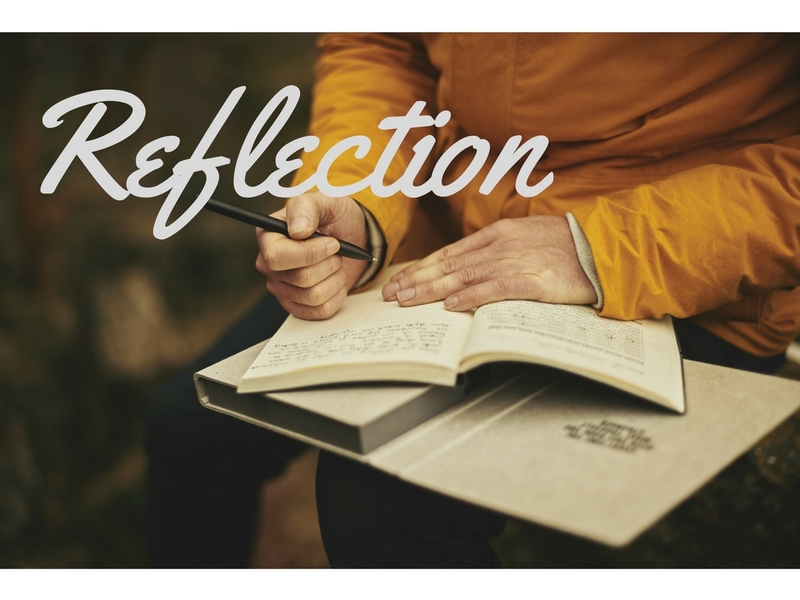 Write a journal entry reflecting how your previous approaches to reflection worked out. Did you already naturally include your personal experiences? If you use a blog, share it with us with the #EmployIDMOOC hashtag. While writing your past contribution, you might have thought about future actions. Did you also include those plans in your contributions? What is an aspect of reflection that was new to you and on which you now want to put special attention? We also asked you sometimes to specifically help others in your contributions, how did you feel about that? 2) Why delay unnecessarily with starting your personal reflection journal? Grab a notebook and write a short entry reflecting about the question of what memorable good/bad experience you had in the last two weeks. Why was it good/bad in particular? How would you like to deal with this differently in future? Have you already finished your journal entry? How about setting an appointment in your calendar to write the next journal entry. As reflection is not something you are paid for, it is often something we push back on our calendar. You could even keep your journal with you and make notes during conversations and meetings to help you record your thoughts. Start now and make a habit out of it. In this last unit, we talk about how to aid your reflection sessions and how to moderate a group reflection session. While reflection is something that naturally happens, sustaining reflection and leading it to successful outcomes cannot be taken for granted. Instead, there is a need to facilitate individual and group reflection. When talking to others about an issue you have to differentiate between knowledge exchange and experience exchange. Knowledge exchange may create phrases like “having meeting agendas helps to make meetings faster”, from which we cannot understand or make sure whether this knowledge comes personal experiences or whether the person has read or heard this somewhere. It is important to base your reflections on your experiences, as otherwise it would be just thinking about “facts” stated somewhere and by someone. Thus, when you reflect or help others to reflect, keep in mind to focus on personal experiences. Similarly, if you reflect together with your colleagues and others are trying to help you with an issue, you can differentiate between solutions derived from reflection, meaning from personal experience of that person, or whether the solution is founded or suggested from other sources such as prior knowledge of a person. Focusing on experience in reflection and relating experiences to other experiences can help to uncover new aspects in your personal or professional life. When reflecting together with others, you can use question prompts to facilitate the reflection in the group. 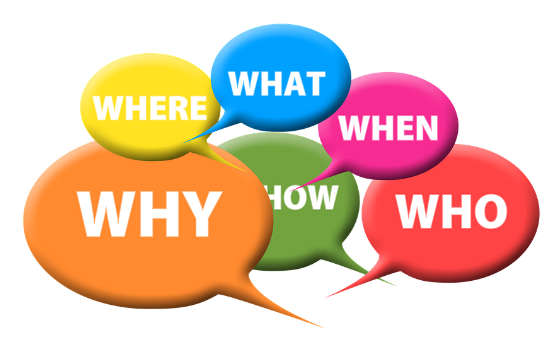 Questions have been proven to be a mechanism to stimulate reflection (Wood Daudelin 1996), and questions provide the added benefit that you can steer the attention of the recipient to certain aspects. What has happened and what did you expect to happen? Why were you feeling that way? What was the most important aspect? How is this situation similar and different from other problems? How might you do things differently? Who might help you with this? What are the implications of all this for future action? As you can see, those stages are related to our basic model of reflection from the first unit. This list is by no means complete but rather provides a starting point and you are encouraged to create your own questions during your reflection sessions. Overall, reflection is a process you can use to aid your personal learning, but you are flexible in how you want to approach each reflection session. This list of questions can be also used as a writing stimulus for writing your personal journal entries. How to Create Learning Outcomes? Reflection is a great opportunity to learn from experiences, but the questions are often how to create outcomes of the learning or how to sustain the learning? First, we advise you to note down what your plans are and how you want to achieve them. This way, you force yourself to spell out your plan rather than just forming a vague plan in your mind. In a second step, often one reflection session is not enough. You might want to reflect a second, third, fourth time about the issue as you might have learned new aspect about the issue in the meantime. For this, you can make use of your reflection journal, in which you can reserve a section in each issue precisely to form a plan on future actions. Then you can follow up on the issue in later journal entries, and continue to learn from your experiences. This way you can visibly see how you continued to learn about various topics. Did something unexpected happen in the last two weeks? Wood Daudelin, Marilyn. “Learning from Experience through Reflection.” Organizational Dynamics 24, no. 3 (1996): 36–48. doi:10.1016/S0090-2616(96)90004-2. In the last unit, we discussed tools for reflective writing to support your personal reflection efforts. In this chapter, we discuss tools, which aid your reflection efforts by providing triggers for reflection. E-Portfolios are often used in formal education and describe a storage repository in which you can store all your learning related artefacts from all your learning experiences: lecture materials, notes from learning experiences, test results, feedback from teachers, and your personal journal entries and reflections. There are multiple advantages of having a personal E-Portfolio. You have an overview over all your learning material and you can use it outside of training experiences to learn continuously. You can use it as a space to store your learning experiences. It is also a nice opportunity to have look through your personal learning material in order to accidently stumble upon some triggers for reflection, aspects in which you wonder “hey, I experienced that in my job and it was similarly or differently because…”. Those moments are great opportunities to reflect about your practice. Researchers have created various picture-based tools, which can be used to guide your reflection. In this section, we present two of them. Apps such as Penzu (https://penzu.com/) are Smartphone-Apps which you can use to take pictures of anything: work related events, experiences in your private life, family events, etc. The app then reminds you every few months that this event has happened and shows you the picture. You are free to attach a rating about how you evaluate the experience now, and you can attach text about for this re-evaluation. In this we can see again the main aspects of reflection with returning to past experiences (the picture) and re-evaluating them (stating how you now think about it). The apps work as a journal-keeping app, but can also send you snippets of your older entries to reflect on. SenseCam is physical device, which has a camera in it. 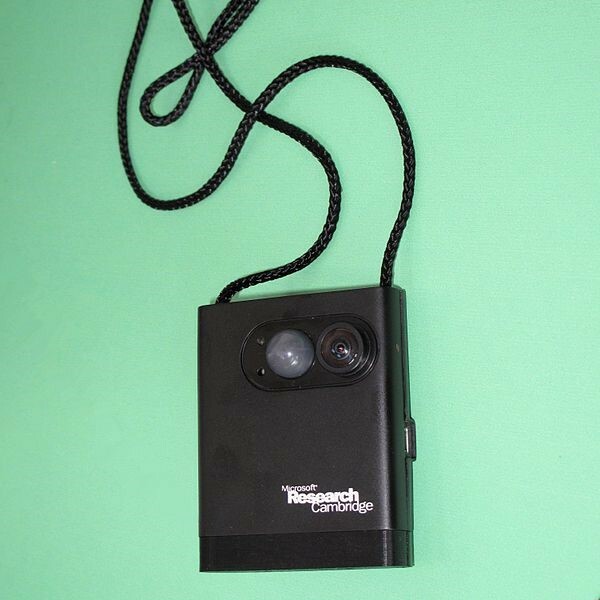 You hang it around your neck, so that the camera is placed on your chest face forward and it then proceeds to take a picture of your viewpoint every few minutes. In a study, researchers used the device with teachers and tutors so that they can assess what has happened. Participants in the study used the pictures as a trigger for reflection, and discussed what happened in their teaching or tutoring session with colleagues to get feedback. Here the images from SenseCam were a picture-based reflection trigger. If you want to use pictures for your personal reflection, you do not need to buy SenseCam: Many camera apps for mobile can be configured to take pictures every minute, and if you wear your phone around your neck, you can document your day as SenseCam does. Look out for Apps, which can do time lapses or stop-motion recorder as they offer continuous shooting with intervals (e.g. Tina Time-lapse for Android, or Stop Motion Recorder for iOS). Task capturing tools are used to track the time spend on individual tasks. For example, they can capture and log the programs you use on your computer (how often, how long) or the apps you use on your phone. RescueTime is one example for such a tool, and there are many more. After using this kind of tool for a longer while, you can identify how much time you spend on individual tasks. You can reflect on this data how you spend your time and can lead to reflection about how to plan your day if you for example uncover that you spend a lot of time on a specific task each day. It is important to note that in these cases you do not reflect about the data itself, but on your personal experiences associated with the data. Have you used other tools which might be also appropriate for reflection? Alexiou, Aikaterini, and Fotini Paraskeva. “Enhancing Self-Regulated Learning Skills through the Implementation of an E-Portfolio Tool.” Procedia – Social and Behavioral Sciences, Innovation and Creativity in Education, 2, no. 2 (2010): 3048–54. doi:10.1016/j.sbspro.2010.03.463. Fleck, Rowanne, and Geraldine Fitzpatrick. “Teachers’ and Tutors’ Social Reflection around SenseCam Images.” International Journal of Human-Computer Studies, Collocated Social Practices Surrounding Photos, 67, no. 12 (December 2009): 1024–36. doi:10.1016/j.ijhcs.2009.09.004. After talking about the basic components in the last unit, we will now have a closer look at writing as a tool to support reflection. Naturally, this method is more suited to reflect after something has happened (reflection-on-action), as one normally does not have enough time (e.g. during a presentation) to sit down for reflective writing. This is also a method which is often used in teacher or nursing education, where learners are explicitly trained in writing a reflective journal. In this section, we show two approaches to reflective writing. There are several benefits associated with reflective writing (Hiemstra 2001, Moon 2006). Overall, reflective writing helps slowing down the pace, as you need to sit down, collect your thoughts, focus your attention and think about how to write something down. 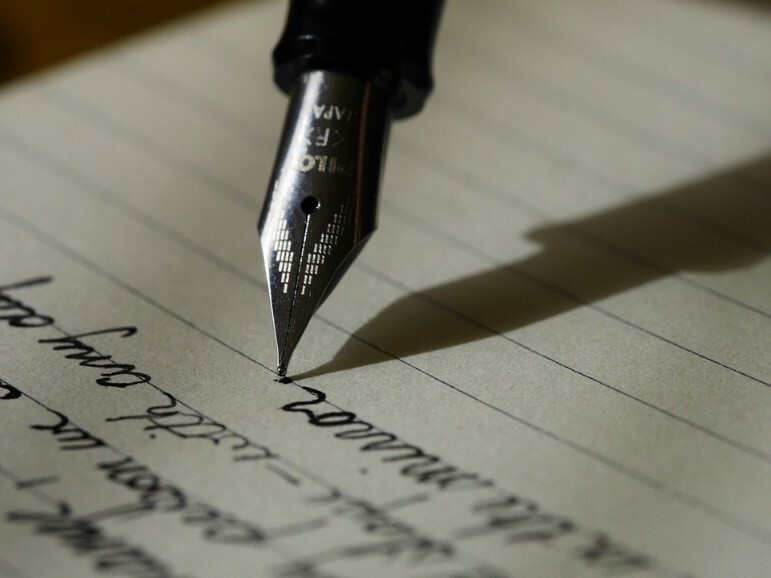 Without the aim to write something down, it is often difficult to find time dedicated to personal reflection about private and professional matters. It allows personal growth and development through freely writing about e.g. integrating learning content in personal and professional life, re-evaluating situations with clients or friends, etc. While writing about learning content you enhance your sense of ownership of learning, as you work to make the learning content working for you. Writing about those personal matters also enhances your awareness about your thoughts and feelings. It can help with self-discovery as it helps interpreting thoughts and dreams. It aids problem solving as you can image your way through a problem while writing it down. Studies in psychotherapy have shown that writing is beneficial for one’s personal health, which also helps to reduce stress. Reflective writing then also helps to strengthen your ability to reflect as you get better at it by practicing. Writing can be also used to keep track of a project and plan it further. This does not mean that you are required to write an entire book now, but instead it helps to start with one entry a week (Hartley 1998). After seeing that reflective writing can have multiple benefits, we now have a closer look at the different types of writing. The next question is often, how to write reflectively. Just writing about a certain topic is not already reflective writing. At first, when you are just reporting about an experience you are performing descriptive writing, which is not yet reflective writing. As we learned in the last unit, reflection consists of the three elements of returning to experiences, analysing them to come up with plans for the future. Therefore, a descriptive part in your writing is necessary to write about experiences. Only when you also analyse your experience and try to come up with plans for future behaviour you enter reflective writing itself. What do you think about this experience now? What would you like to handle differently? How do you plan to react in future? More ideas for reflective writing are shown below in the section about how to start writing. Now, that we know how to write reflectively, we look at two different types of writing down your experiences and reflections: Journals and Diaries. There are different kinds of journals: e.g., learning journals, professional journals, etc. (Hiemstra 2001). Learning Journals are often being used during an education experience, and professional journals can contain personal growth or personal development when starting out in jobs. Both can be used to put learning content into practice, or to also compare experience from practice into context with the learning context. Some of the tasks in this course have been created correspondingly. This is also very helpful for new employees who recently finished vocational training or studies. Entries in learning journals contain reflections, feelings, or personal opinions from that learning experience. Those entries are often written in a specific structure, which aids the writing and imposes some restrictions on the writing as well. This structure can be given e.g. in learning tasks, or by specific questions, or the journal itself has a template. You do not need to start out with a learning journal focused on a single aspect, but rather a general reflective journal. 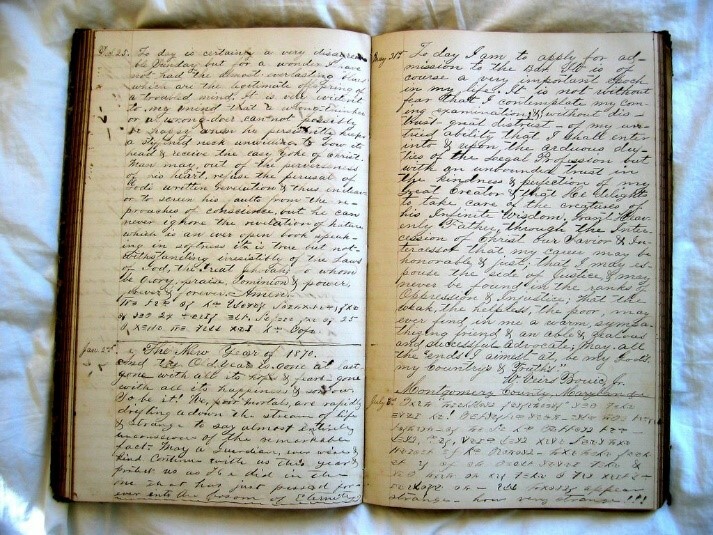 Journals are often hand written. On the other side, diaries are not related to specific learning experiences, but rather a format of chronological ordered, but unstructured events, which happened in your life. For this, you can use a blank notebook, but also electronic or audio diaries. 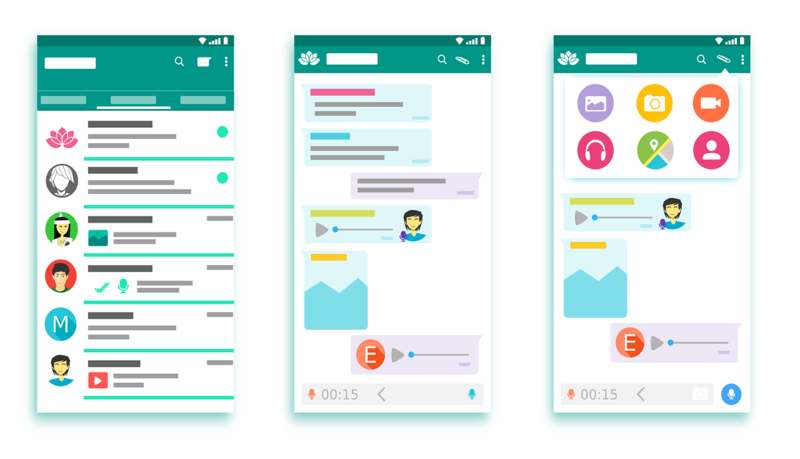 If you want to write an electronic diary and share it with others, you can use blogs (web logs) or apps on your smartphone. In all this, it is important to note that reflective writing is an important step in reflection, but writing alone does not cause changes in your life. You still need to act based on the results of your writing. Coming back to the reflection models in the last unit, we can state that reflective writing is one tool do perform personal reflection, and which can be used to write down personal experiences. The outcome part of putting plans into action is still required. Reflective writing can be used either alone or in a group. The forms of writing described above are at foremost an instrument of personal reflection, but can be also used as a medium in collaborative reflection. In groups, a journal entry can be exchanged with others. For example, one writer starts writing her thoughts about a topic and then passes her journal entry on to the next person in the group. For this, it is necessary that there is a certain level of trust amongst group members so that people are willing to share their journal entries with each other. This is also used in education settings, where a student shares her reflections with her teacher, so that the teacher can also guide the student’s reflections. Depending of the willingness of a group at work you can also form a reflection group and exchange reflective journals. One form to do this is called “jotter wallet” (by Longenecker 2002), in which there is a case of index cards and one person starts with noting down ideas and experiences from interesting cases. The wallet holder shares the content in the wallet with the others each week. She then presents a case and poses some questions to guide the discussion about the case. Then the wallet passes to the next person in the group. Another technique is called “Community reflection” which takes roughly 90 minutes. At first participants are introduced to the process and agree on a set of rules (e.g. not sharing sensitive content with outsiders; not judging each other, etc.). Everybody spends 20 minutes reflecting by themselves using a learning journal or similar. Then there is a session of 50 minutes led by a facilitator and a set of question in which everybody can participate with their personal reflections. At the end, everybody can also make comments on how they perceived the entire session in a brief summary. Another form of reflective writing can be found in (virtual) communities of practice in which you can pose questions and help others. Communities of practice are groups of people who share the same practice in the same domain (e.g. working as a nurse, or working as a counsellor for unemployed job seekers, etc.). Those groups are often connected to each other at the workplace, or through portals on the internet. The latter is often described as a virtual community, as members often do not know each other and member’s locations can span multiple countries and time zones. Communities of practice can be used to reflectively analyse a problem and obtain help from others. In case one does not fully trust everybody else in the community, some community platforms allow also for anonymous contributions, which sometimes make it easier to share personal thoughts about a topic. Starting a journal or a journal entry is often difficult when you are sitting in front of a blank page of your notebook or have a blank screen on your computer and need to type in the first words. In this section, we present some guiding principles and aspects, which you can use to start writing. When setting up a journal, take some time to define what you intend to reflect about, e.g. whether the journal aims at your private or your personal life. Then it might be easier to start, if you already know a few topics you want to write about. If you define for yourself with whom you might want to share the journal, it might be easier to start. If you do not want to share it, that´s fine too. In addition, you do not need to think about a proper length of journal entries. Some topics are naturally easier to write up and other more complex topics might need more time and space of writing to develop a clear idea of what the issue might be and how to proceed in future. In education settings, it is recommended to write approximately once a week to get a habit of writing. Make it your own: Your journal is primarily for you and not for someone else. Thus, create it towards your specific needs and not some needs someone else might have. Do not overthink the first entry; your journal can evolve over time as your personal style of reflection develops and changes. Be honest: Be honest with yourself in your entries. The purpose of reflection is to critically rethink experiences, so there is no need to lie to yourself. Let words flow: Just start with writing, and start with what comes to mind regarding the topic at first. Over time, you might approach some topics more structured, but your journal entries do not need to be perfect from the start and you can flexibly adapt them in future. Use your own words: Use the language you understand best, as the journal is for you specifically. This way the entries might be also easier to write, and easier to think through. Dig deeper: Do not stop at simply writing down experiences, which is more descriptive than reflective writing, but create also a habit of thinking about what to do differently in future in order to learn from it. Challenge your own previous assumptions about the topics you write. Seek help if necessary: You can ask others who are also using journals for reflection about some tips. In addition, if you are part of a learning experience you might ask your teacher about some tips for reflective journals (and check out the reading materials below). Be selective: Studies have shown that some people write a lot more that they would´ve really needed. Therefore, you might need not to note down everything, but can rather think about what belongs to the topic and what does not. 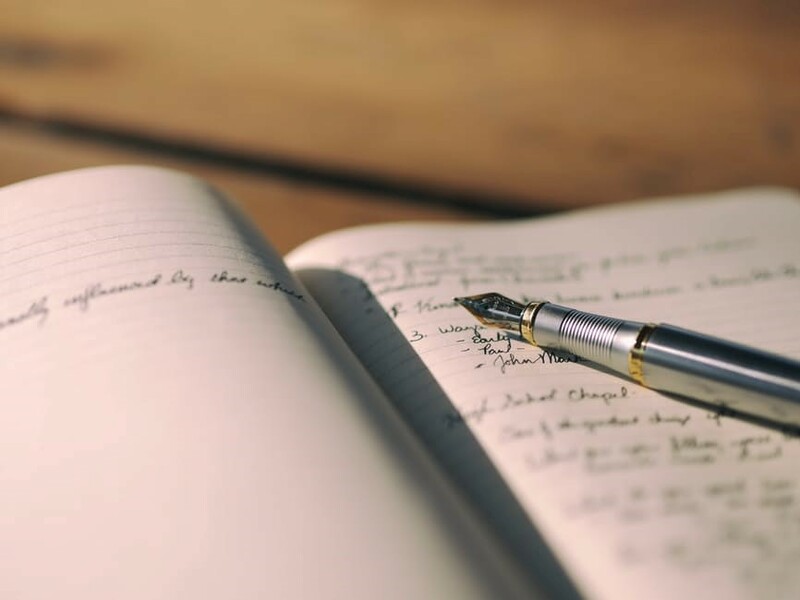 Although there are many smartphone apps out there allowing you to write diaries and journals, we encourage you to keep a hand-written journal instead. In comparison to an app, you are freer to do what you want in a journal (drawing, changing your personal layout of individual entries, having longer and shorter entries etc.). What are topics, you think most about and which you would like to start a reflective journal or diary about? How could you use the techniques discussed in this unit in your everyday practice? Do you think it would be a useful technique for customers, clients and colleagues? Moon, Jennifer A. Learning Journals: A Handbook for Reflective Practice and Professional Development. Routledge, 2006. Hiemstra, Roger. “Uses and Benefits of Journal Writing.” New Directions for Adult and Continuing Education 2001, no. 90 (June 1, 2001): 19–26. doi:10.1002/ace.17. Wenger, Etienne. Communities of Practice: Learning, Meaning, and Identity. Cambridge University Press, 1998. People often have a natural feeling of what reflection might encompass. In this section, we want to talk about what reflection is and what components are necessary for you in order to “reflect”. This is not supposed to imply, that previous reflections were wrong, but rather should help you to utilize fully the process of reflection. Reflection itself is a form of learning from experiences, which is often used unintentionally by people but can be also used actively and on purpose. When we talk about reflection, we differentiate between three different components as shown in the figure below. The reflective process starts in the middle of the picture in the reflective process. A trigger for reflection is mostly a perceived discrepancy between what you expected and what you experienced. Then you return to that experience to analyse it, and to re-evaluate it with your current knowledge and experience. The goal is to come up with an idea or plan how to improve on the topic in future, and ideally to take first steps. To give you an example: Imagine you need to give a presentation about a new topic at work to your boss and you think that you might perform horribly. After the presentation, your boss compliments you on your presentation and you are left wondering why. Here we can see you observed a discrepancy between what you expected (something bad) and what you experienced (something good). When you uncover this discrepancy, you can sit down to reflect (reflective process). While most people often think of negative example for reflection triggers (presentations gone bad, failed at an exam, arguments with a client, etc.) those triggers do not need to be negative, and you can reflect about things, which turned out to be better than you expected. In those situations, you want to focus on sustaining your success also in future situations. In this example, you then think about the presentation and your boss liked it. (returning to the experience). When reevaluating it, you might uncover, that you were prepared for all questions your boss had (reflective process). After identifying a possible reason, you note to yourself that for future presentations you need to engage in a careful preparation so that you can answer all questions (outcomes). This was a simple example showing how to learn reflectively from a positive experience in order to have similar positive experiences in future. Although the example is quite simple, in reality, there may be more cycles involved between the reflective process and your experiences as it might be harder to figure out possible reasons for why something happened or how to improve on something. So, where and why should you reflect? Reflection is a technique, which can help you in both your private as well as your professional life. It can help you actively engage with a period of change in your environment (e.g. family, location, and work place), dealing with a high caseload, venting or thinking about new ideas. Often reflection is related to informal learning, meaning that it happens outside of structured learning experiences (e.g. vocational trainings). Some teachers are also including reflection in training experiences and plan learning material around it. We differentiate the timeliness of the reflection session in relation to the point of time in which the action happened. In most occurrences people start reflecting after something has happened and they start to analyse why something did not go as they expected. This is called reflection-on-action by Donald Schön (1983), which only occurs after the action has finished. On the other side, there is reflection-in-action, which describes that someone starts reflecting during the current activity to analyse whether current actions are appropriately or whether something needs to be changed. Reflection-in-action is more difficult to perform, as one needs to find time to reflect about the situations and still continue, but helps to adapt your activity while you are carrying it out. By now, you probably still think about why the previous example only included you and not your friends and colleagues. We differentiate between individual reflection, in which you just reflect for yourself, and collaborative reflection, in which you can reflect individually on some parts, but also together with your friends or colleagues. The basic idea of learning from experience remains the same. In an extended model, we can see how the group aspect unfolds. Two additional dotted lines symbolize that you can integrate a group of friends or colleagues to help you reflecting. In this picture, the labelling hints at integrating your reflection efforts into your work environment. In order to reflect together with your colleagues, you need to share some of your experiences so that your colleagues know what has happened in order to discuss possible outcomes. Having a shared understanding of the case is required to discuss it and to derive outcomes. 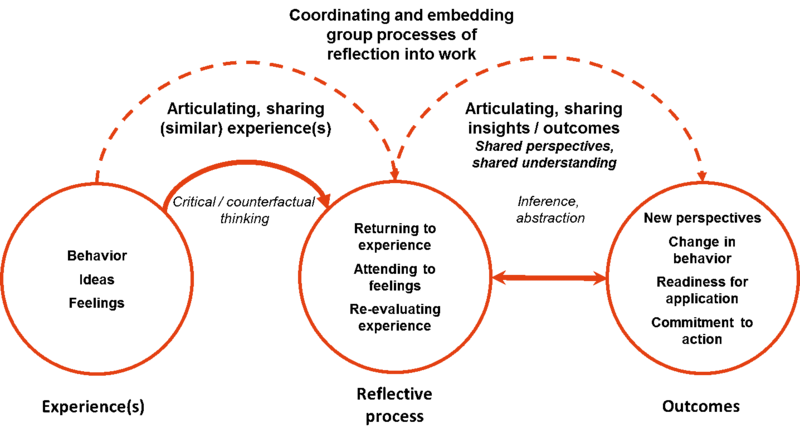 Deriving outcomes can also be performed in a group. To conclude this unit, we can summarize reflection as a method to learn from experiences. In this you return to experiences, re-evaluate them in order to come up with ideas on how to behave in future. This can of course be done alone, or together with your colleagues, friends and family. What topics do you deliberately reflect about? What was the last experience you reflected together with a colleague or friend? How does this information about reflection help you? Kolb, David A. Experiential Learning: Experience as the Source of Learning and Development. Prentice-Hall, 1984. Schön, Donald A. The Reflective Practitioner: How Professionals Think in Action. Basic Books, 1983. Prilla, Michael. “Collaborative Reflection Support at Work: A Socio-Technical Design Task.” ECIS 2014 Proceedings, June 7, 2014. http://aisel.aisnet.org/ecis2014/proceedings/track12/2. Prilla, Michael, and Bettina Renner. “Supporting Collaborative Reflection at Work: A Comparative Case Analysis.” In Proceedings of ACM Conference on Group Work (GROUP 2014). ACM, 2014.